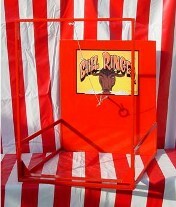 This is a larger version of the popular Bull Ringer carnival game. You try to swing the ring onto the hook on the bulls nose. The game is 28x33x36 tall set up and 28x37x9 when put away and weighs 45 lbs.